Recently, I saw this post on the House of Hepworths blog. Allison removed the ugly pull cord from her attic stairs and replaced it with a sleek eye-bolt and pull hook. (She has the step-by-step details, including a supply list, in her post.) I decided that this looked like just the sort of low-effort, high-impact project that would effectively fill those boring afternoon hours when it is too hot to go outside (I also frequently fill those hours with naps, but I like to have options). First, I opened the attic stairs and cut the pull cord. Then, I gave the access panel a fresh coat of paint. Once it dried, I realized that the fresh paint on the panel made the trim around it look dingy, so I painted that as well. Then, I inserted the eye bolt into the hole vacated by the pull cord. The eye bolt was a little larger than the hole so I had to drill it out a bit. Next, I drilled a hole into the end of a 1-inch dowel, and screwed in the hook. 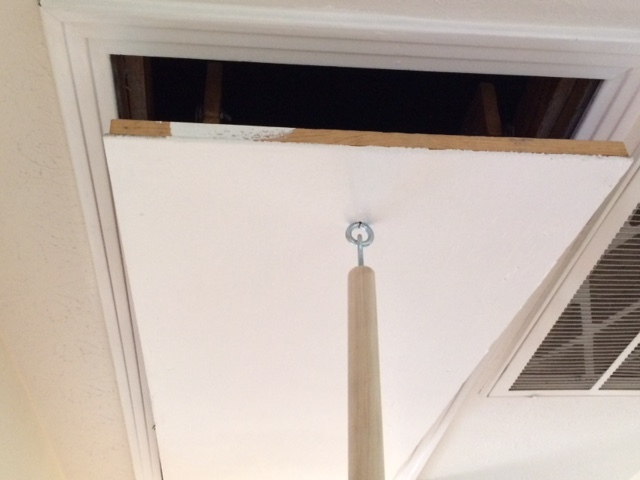 The dowel and hook can now be used to open the attic door, rather than standing on tippy-toes to reach the pull cord. 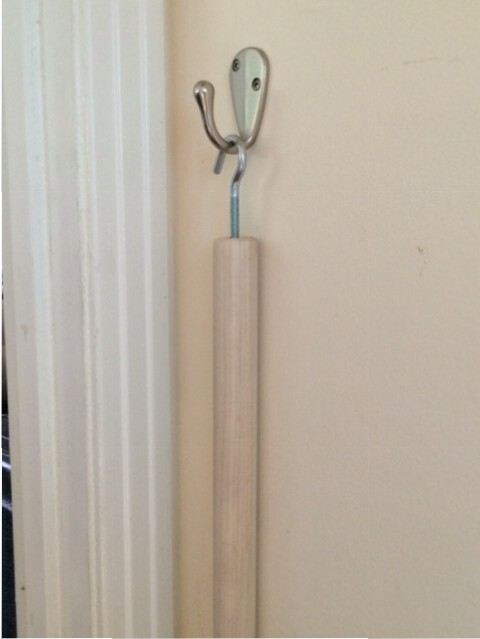 I attached an attractive hanging hook to the wall, right near the attic, but out of the way, on which to hang the dowel and hook when not in use. I don’t have any before pictures, but believe me, the fresh paint and eye bolt make this part of the ceiling look 100% better. The whole project only took about 30 minutes, minus the time that the paint was drying, but the new look makes me happy every time I go upstairs. Minimal effort, high impact.